Stroll across to the Friday Flat ski area & ski with the kids or take a ride to the top on the Gunbarrel Quad Chair. Want to hire some gear or take a lesson, everything is so close, all across the road. After a hard day on the slopes enjoy the spectacular mountain views from this beautiful apartment. Relax in the wonderful living area that fill the second floor of the apartment, cosy up in front of the fire, or enjoy a drink & nibbles on the deck. Take a walk to the village for a restaurant treat or a spot of shopping. Try a winter swim in the Olympic pool in the Thredbo Leisure centre just 100m away then come back and chill out in Angala 3. Angala is spread over 3 floors, the ground floor has the carport, entry, bedroom 2, bathroom & laundry/drying room, the first floor has all the living area & deck, & the top floor has the main bedroom & a bathroom. Summertime at Angala 3 can be so quiet and relaxing. Picnic on a boulder or lay on the lush grass. Watch Merritt's Creek ramble by or the clouds cast shadows on the mountains. BBQ on the deck and watch the wildlife. Stroll to the village for a restaurant meal or a little shopping. Summertime can also be exciting and active. Go ride a bike, explore the many bush walking trails, take a swim in the Olympic pool, play golf or tennis. The choice is yours! Winter season departures are on either Friday or Sunday. We recommend travel insurance for your holiday. We built the Angala apartments in 2005 & we luckily kept Angala 3. Angala 3 is in one of the best positions in Thredbo. Set on level land next to Merritt's Creek we have an easy walk everywhere. Our views are spectacular as there are no buildings to obscure it. Angala 3 is so close to Friday Flat, just across the road to the ski field & the chairlift, so it's a quick walk home for lunch. Friday Flat is the place to be for beginners, ski school, lift tickets, ski hire & retail. For more advanced skiers & boarders the Gunbarrel Quad Chair will deliver you further up the mountain. The deck opens onto the living room. Angala 3 is the closest apartment to the ski lifts. It is opposite the Friday Flat ski area & the Gunbarrell Quad chair. In Friday Flat you will find ski school,ticket office, ski hire, & restaurant. Our family of six had such a wonderful stay in Angala3. The design and space areas suited us immensely. I highly recommend this stay. We went in autumn and will be back for the ski season! Thank you for your wonderful review. Hope to see you again, as you are always welcome. The apartment is very well maintained. It is also warm and cozy which is great during winter. Great location as well, it's just a 3 minute walk to Friday flat and chair lifts. This place has exceeded our expectations and would definitely stay here again for our next visit. We stayed at Angala 3 apartment, for 3 nights. The Apartment is lovely and warm in winter and beautifully presented with every detail of finishings. Its in the most excellent location right opposite Friday Flats, and easy access to Merritts via chairlifts for more advanced skiers makes accessing the fields so easy. 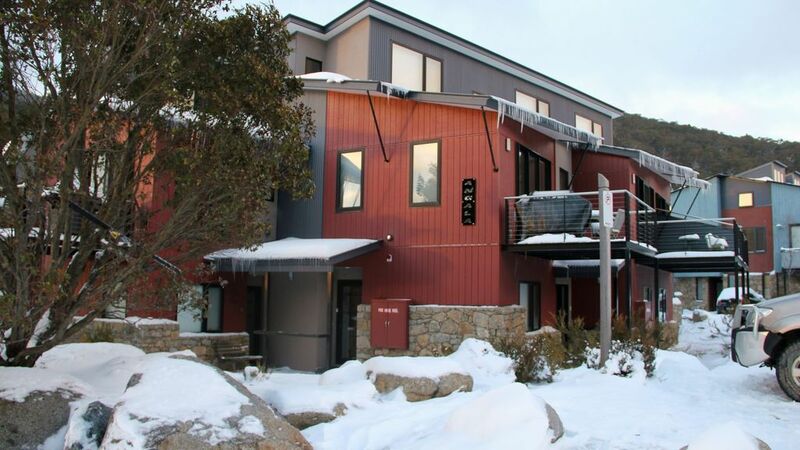 Ideal for a family with a baby or children, also its only a short walk to the main Thredbo village. We thoroughly enjoyed staying here, we'll be back for sure! Thank you Robyn for a delightful stay! Thank you Ben for your great review. I agree Angala 3 is in a wonderful position, especially for you with the baby. Please come & stay again, you were excellent guests.